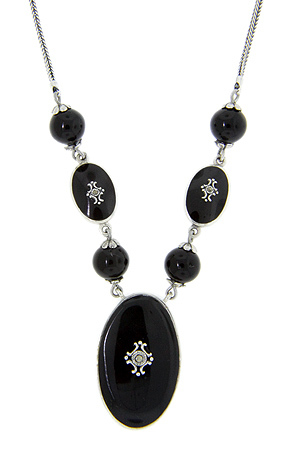 Ovals and beads of black onyx are decorated with sterling silver and marcasite on this antique style necklace. The center oval measures 1 1/2” in height by 7/8” in width while the necklace measures 16” in length. The necklace is also available in mother-of-pearl.